State weather bureau is expecting Tropical Depression outside the Philippine Area Of Responsibility to enter this Tuesday morning, October 29. PAGASA said this is the 22th cyclone to enter the country and it will codenamed bagyong "Vinta." PAGASA weather bulletin as of 5 a.m. today, "the center of Tropical Depression was estimated based on all available data at 1,150 km East of Virac, Catanduanes." 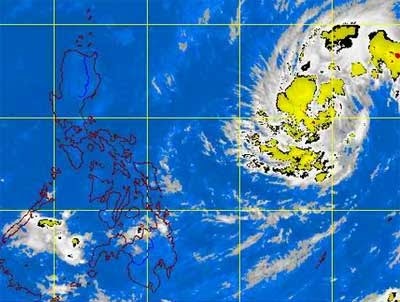 It packs with maximum sustained winds of 45 kph and moving west northwest at 20 kph, according to PAGASA. PAGASA estimated the amount of rainfall from 5 - 7.5 mm per hour (moderate - occasionally heavy) within the 300 km diameter of the Tropical Depression. But don't worry, because bagyong Vinta will not yet affect any part of the country, PAGASA said. For the meantime, please bookmark this page now or visit this site more often for you to be updated. You may also share this post to your friends so they may know about Bagyong Vinta Update. Comments or suggestions about "Bagyong Vinta Update as of Tuesday, October 29, 2013 - PAGASA" is important to us, you may share it by using the comment box below.